Moon, you know I am an inconstant lover. I commit to you, and then I get busy and harried, then forget. May this love letter to you breathe into me new commitment. Twenty years ago, while recovering from a strange illness that left me without a voice for six weeks, I woke in the night and saw you, in your fullness, in your brilliance, and I lost my heart. I want to be with you, I said. I want the freedom to stay up at night, as I did that night, to just watch you, with nothing else to do. It was a prayer, though I didn’t know it at the time. You did…and you answered. Every month, you waxed and waned, sometimes hiding behind clouds, other times shining over the water. You gave me a glimpse of your power and mystery, and you reached out with your glow to touch my face with support and loving care. Yet I have been disconnected from you, moon. I lost sight of you except for an occasional glance at the night sky, when you rise over the water and command my attention. I lost you when I lost my female cycles. It never occurred to me at the time that those cycles still exist within me, and you are the key. Women who study Ayurveda, a sister science to yoga, believe the moon is important to women. The New Moon is for introspection, they say, and the Full Moon is for clarity, power, and manifestation. A few months ago, when I added more Ayurvedic practices to my life, I began to pay attention to you again. 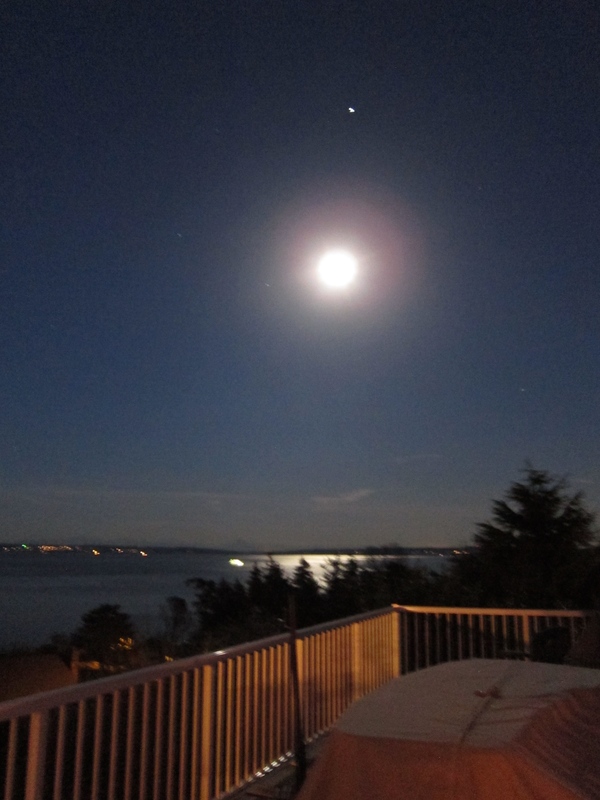 I notice higher levels of energy — and agitation — during the full moon. It’s no surprise to me that this week, as you wax toward your full glory, I am carting bags of compost and manure into the garden. I am weeding and feeding my fruit trees. I am writing busily and happily. I feel strong and alive. In a few weeks, when you wane to near-darkness, I will begin my period of spring cleansing and reflection. What if I can reconnect to your rhythms? What if I can dance once again with your ebb and flow? Do I stare stare full in the face of magic? Do I claim my right to know your mysteries? I will walk this path to find you, and then I will know the answer to those questions. I send you my love, mysterious moon, and I glide in your river of sweet, soft energy. For more on this month’s full moon, visit these websites. I am not into astrology, but some of them are fun anyway. Enjoy! 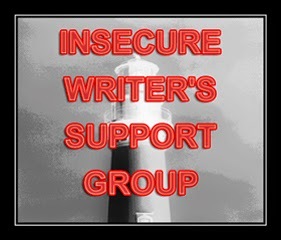 I am grateful for finding the Insecure Writers Support Group. We’re starting the A-Z Blog Challenge in April, but already I’m feeling the love. We also have a monthly group post, and today’s the day. Thanks, all! We Haven’t Come Such a Long Way, Baby! Remember the cigarette ads for Virginia Slims cigarettes? In 1968, we women got a cigarette designed just for us, giving us equal rights to die of lung cancer. Yay equality! Meantime, equal opportunity issues abound in the workplace. In my last job, the commercial reps were all white men. When I had my exit interview, I pointed out how ridiculous that was. The HR rep, herself a woman, told me with a straight face that they couldn’t find any qualified applicants who were females or minorities, even though other oil & gas companies seemed to manage. I worked in administrative hell, where we couldn’t even get appropriate software to do our jobs, even though that meant exposure to fines and contract violations because we couldn’t keep track of thousands of contract provisions in our heads. Women worked in administration, and administration didn’t generate revenue, so we just had to make do. After a failed campaign to update our systems, I knew it was time to go. If I seem unduly stirred up by something that happened seven years ago, it’s because of what happened last week. By now you’ve probably read the crazy obituary of author and neuroscientist Colleen McCullough, most famous for her novel The Thorn Birds. Does anyone remember Richard Chamberlain in the movie? Hubba hubba. But I digress. Anyway, if you haven’t read it, catch up on it here. This prolific writer, with scores of accomplishments outside of the world of words, was diminished in an obit that focused on her appearance. Ever since I returned from the U.K., I’ve studied various biographies of Charlotte Bronte. Elizabeth Gaskell’s The Life of Charlotte Bronte, which influenced generations of readers, portrays this brilliant woman as a tragic figure whose subversive Jane Eyre was an accident of a poor, spinsterish daughter of the church who didn’t know any better. Sadly, Gaskell, who knew Charlotte Bronte, took her cue from the author herself, who had already written apologetically about her sisters, Emily and Anne, for publishing “coarse” novels that included Wuthering Heights. Sure, Bronte was a tragic figure. Anyone who is the last survivor of many siblings, who herself dies young, gets a pat on the back for a tough life. However, like Colleen McCullough, Charlotte was ever so much more. Jane Eyre broke new ground in its portrayal of a woman who would have love only as an equal. In real life, Charlotte Bronte turned down several marriage proposals (eventually marrying late in her life). She had an intense relationship with a married man — unconsummated, and unrequited, but one where creativity and intellect brought out her deepest passions, which fortunately for us ended up on the page. She was, by all accounts, “plain,” just as Colleen McCullough was reported to be. But who cares? Someone does, obviously, or we wouldn’t still have to deal with this drivel. Novels written by women still do not garner the same attention for awards as men’s novels do. Female politicians are expected to be “hot” more than brilliant. I know when to hand the phone to my husband because certain people, such as mechanics, will respond differently to him as a man. I can’t tell you how many jokes I’ve had to listen to about women and shopping, women and shoes, women and [fill in stereotype here]. Ladies, we need to claim our power. Whatever we do in this life, we need to share our fullness and strength. We are more than our weight, our complexion, or our hair. The Guardian did a better job with Ms. McCullough here, acknowledging her many accomplishments with warmth and humanity. Let’s acknowledge those who treat us with respect and continue to call out those who do not. Did you know that the Bronte sisters, Charlotte, Emily, and Anne, wrote and published a book of poetry that sold only two copies? Though well reviewed, the book flopped. Even when they did achieve literary success, it came under male pseudonyms, and reviews after they were outed as females took a nosedive. Yet Wuthering Heights and Jane Eyre remain two of the greatest and best-loved novels in history. The Bronte sisters wrote together, and we can imagine them bouncing their ideas off of one another, but they also wrote wildly. Their stories were too “improper” to be written by women. Yet they couldn’t help themselves. In their regular walks along the Yorkshire moors, strolling through thigh-high fields of heather, they captured the passion and raw fury of winds and rain and exposure, stamping unforgettable settings and emotion in their work. They wrote true to their natures, and their boldness has kept their novels in the public ever since. 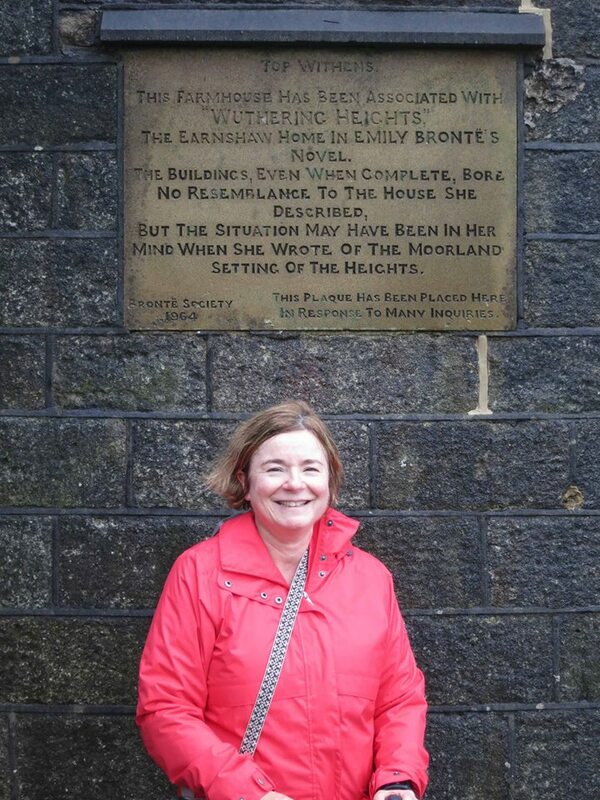 Recently I had the great privilege to walk the moors the Bronte sisters once did. I visited the home where they made history, looking at their tiny clothes (including Charlotte’s wedding bonnet) and pondering their lives. Of course, I came home with a stack of books to learn more about them. As always, it helped me as a writer to literally walk their path. A hike to Top Withens, said to be the inspiration for Wuthering Heights, brought the stories more deeply into my bones. I don’t pretend to even come close to the skill of these authors. 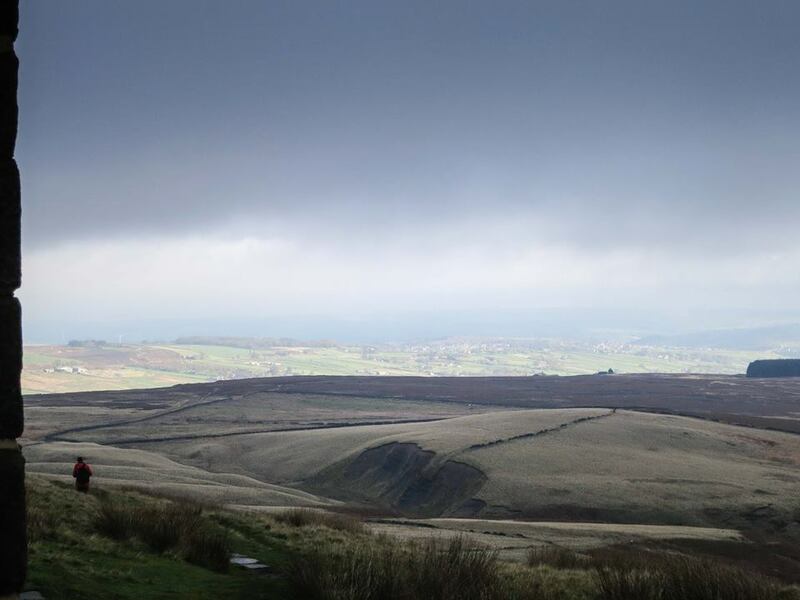 I do know, though, as I walk along the moors, absorbing the life and strength they emanate, I am adding to the files of my imagination. 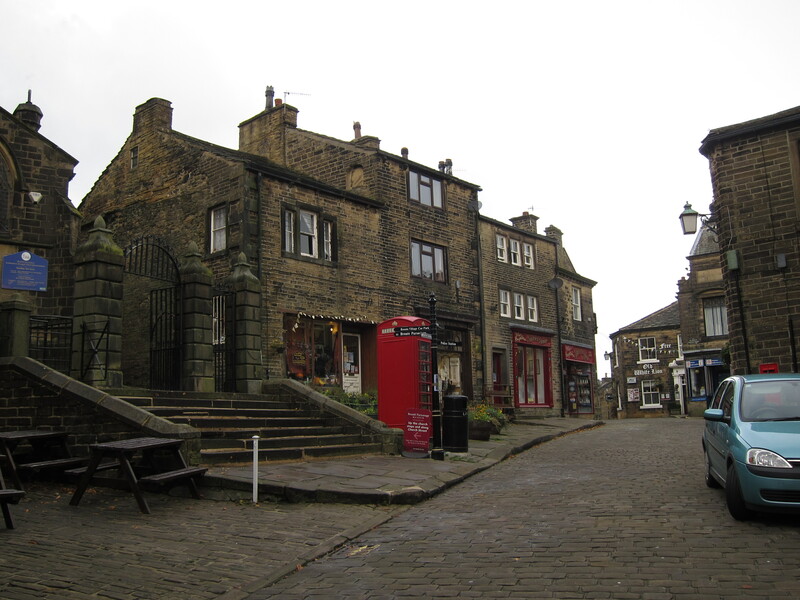 The Bronte ghosts tell me they, too, were merely human, and struggled to balance their unusual writing styles with the marketplace of the time. Their struggles are different, but we understand each other. I return to my own work renewed and inspired to continue. Miss Alcott’s E-Mail: Yours for Reforms of All Kinds by Kit Bakke – This book falls under the “why didn’t I think of that?” category. Bakke and I share a fascination with Alcott, a woman well ahead of her time. Through the magic of story, Bakke manages somehow to reach Alcott by e-mail (Alcott receives the messages as handwritten letters) and they share a correspondence. This is particularly interesting given Bakke’s former role in the Weather Underground. I’m having trouble putting this one down! Heat: An Amateur’s Adventures as Kitchen Slave, Line Cook, Pasta-Maker, and Apprentice to a Dante-Quoting Butcher in Tuscany by Bill Buford – I think the title is a thorough description, wouldn’t you agree? The Forest for the Trees by Betsy Lerner – This is a book for writers about writing and writers. It’s a good pick-me-up for when inevitable discouragement arises. The Vegetable Gardener’s Guide to Permaculture: Creating an Edible Ecosystem by Christopher Shein with Julie Thompson – Though I’m brand-new to the concepts of permaculture, I’ve drunk the Kool-Aid, or perhaps spread the compost, because I believe that many of our world’s ills can be resolved with this approach to gardening, and to life. Are you reading anything good these days? Do tell!